be shown possibly to be an indicator for a missing heavy baryon octet. accidentally, but might not be correlated to the p-p result. tence of a Higgs field. confined to studying the solutions of the neutrinos. where 2πq is the quantum flux for a charge “q”. nor in 5D space-time manifold, via gauge transformation. 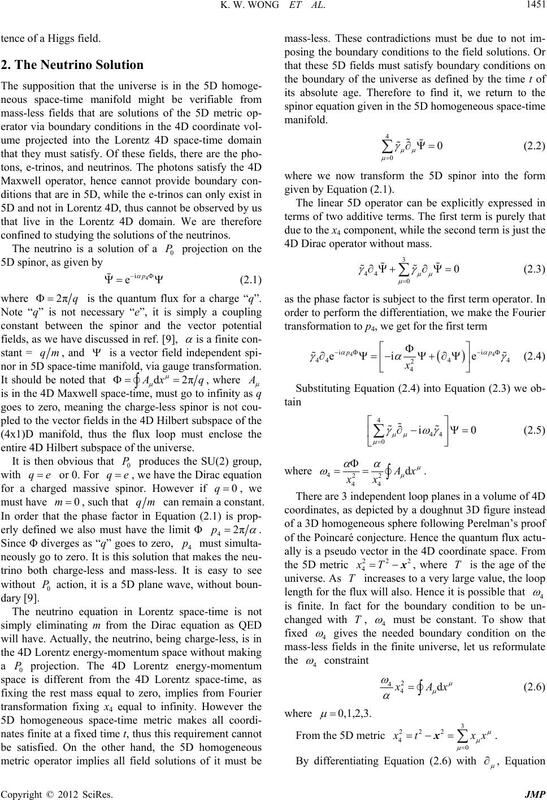 entire 4D Hilbert subspace of the universe. 0mqm can remain a constant. 4D Dirac operator without mass. 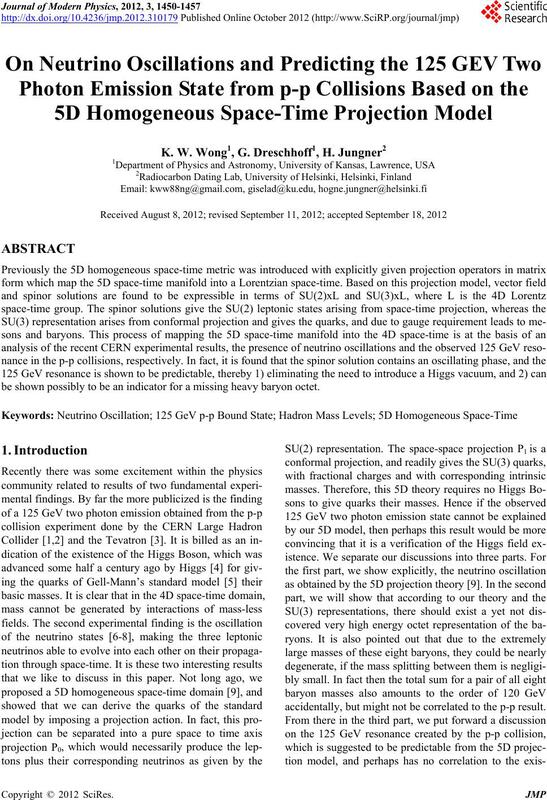 K. W. WONG ET AL. nor field energies also increase in proportion. tials as given by charged spinors, and no light reflection. mass-less brings its solution back to a simple plane wave. a-symmetry between the neutrino and the anti-neutrino. that indicates we have a matter universe. tized on the flux loop provided by the gauge constraint. stituents in the pions implies that a static model is invalid. We will now show how these problems are removed. 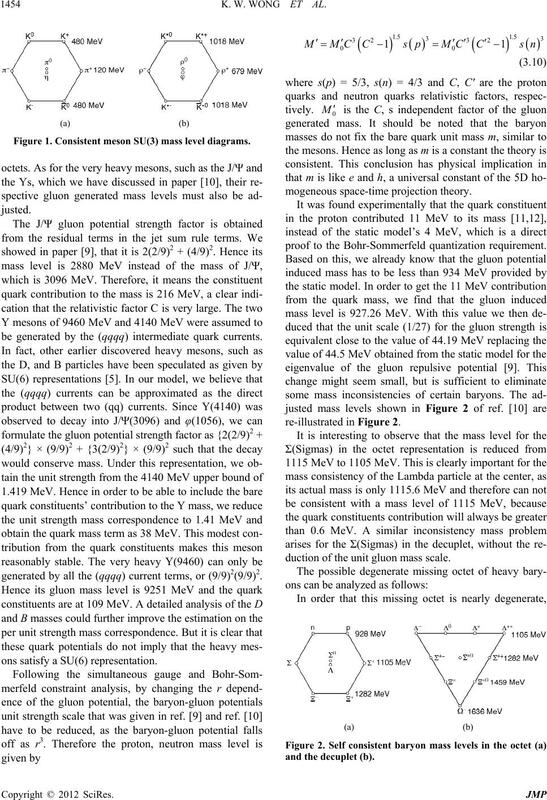 is the unit quark rest mass. arged pion and the neutral pion. ous from Lenz’s Law that we must have C' > C > 1.
is very small, then there exist a consistent solution. as mC and d, d'. time P1 projection mathematical requirement . Figure 1. Consistent meson SU(3) mass level diagrams. be generated by the (qqqq) intermediate quark currents. generated by all the (qqqq) current terms, or (9/9)2(9/9)2.
ons satisfy a SU(6) representation. duction of the unit gluon mass scale. where a, b, c are integers, such that 2B > 3D. e seen that there is a wide range of choices. 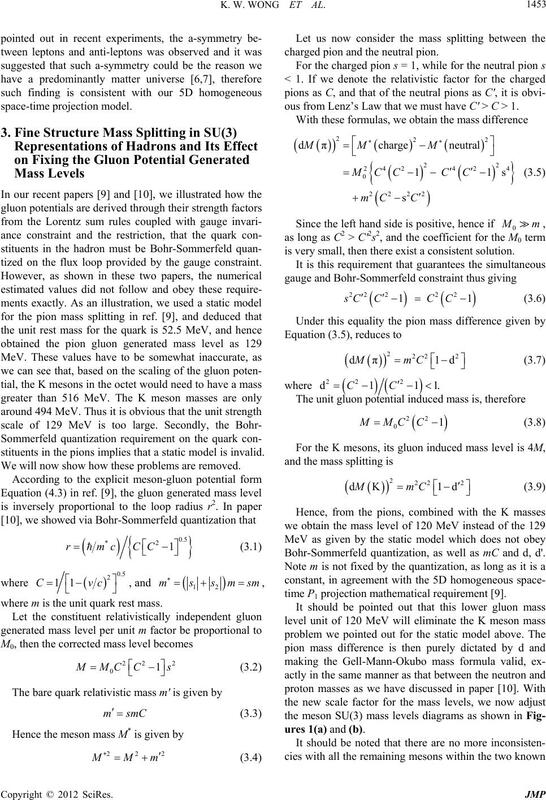 For minimum, it w mean D = 0.
never reach the 125 GeV value. as the factor (8/27)2 is unique to these baryon states only. 120 GeV has no relationship to the missing octet. 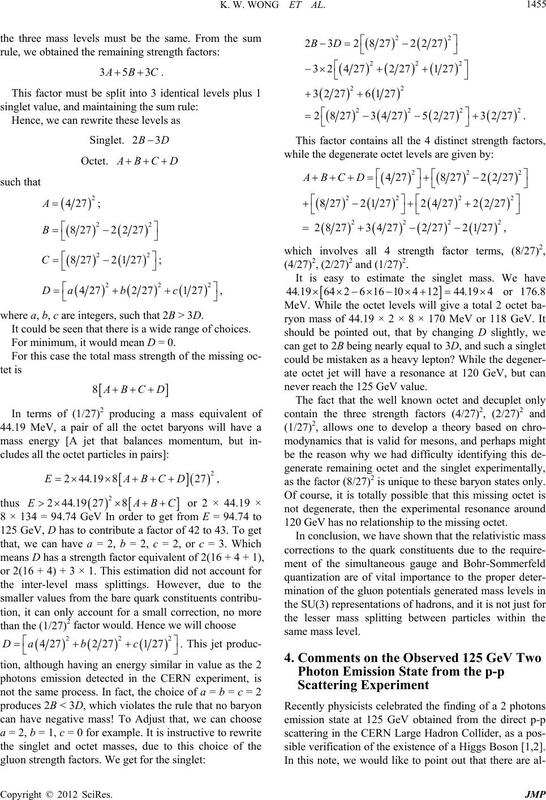 sible verification of the existence of a Higgs Boson [1,2]. voking the presence of a Higgs field. state is formed, then it must consist of 4u and 2d quarks. photons emission is totally predictable. tual values for the meson and baryon masses. er than those in the known octet and decuplet. 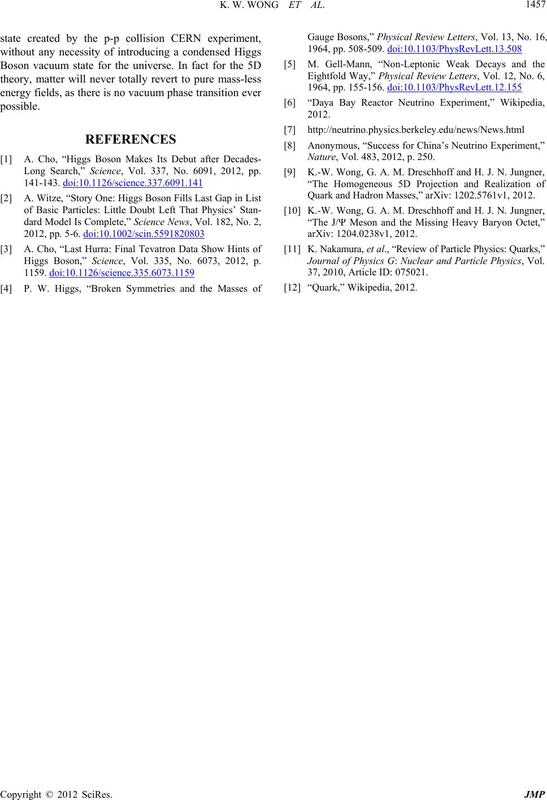 Long Search,” Science, Vol. 337, No. 6091, 2012, pp. 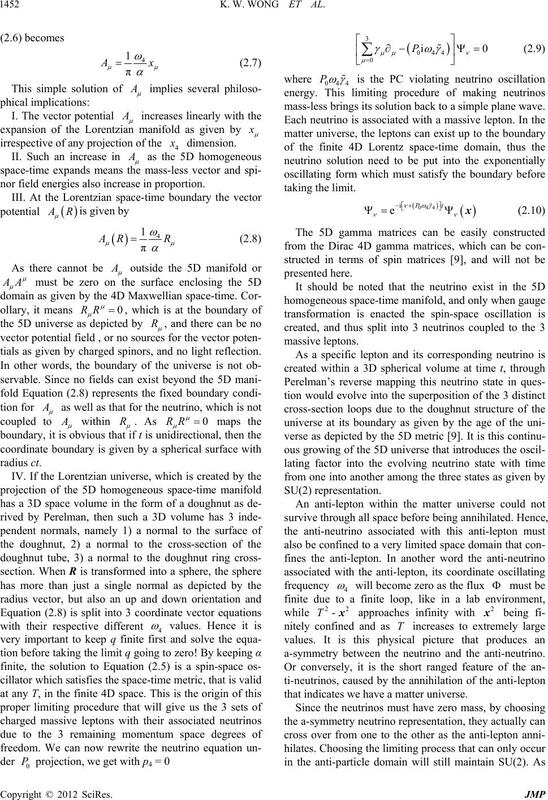 Higgs Boson,” Science, Vol. 335, No. 6073, 2012, p.
Nature, Vol. 483, 2012, p. 250. 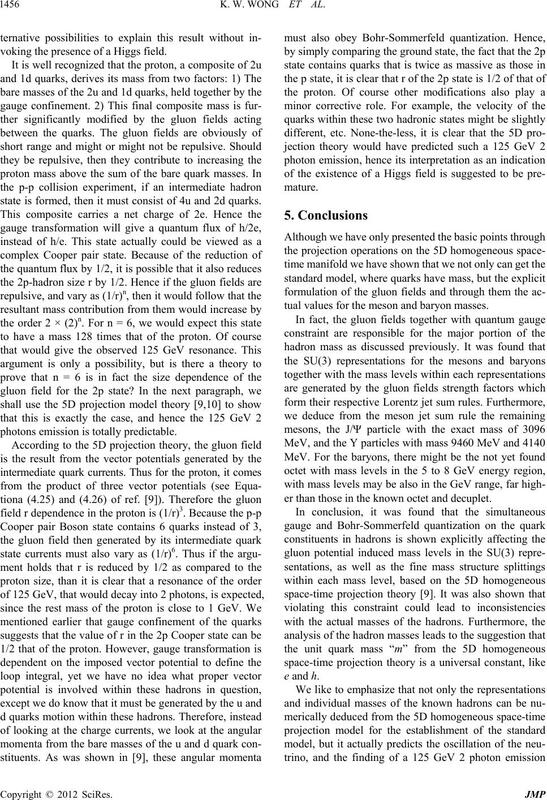 Quark and Hadron Masses,” arXiv: 1202.5761v1, 2012. 37, 2010, Article ID: 075021.